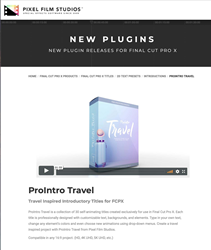 Developers at Pixel Film Studios Release ProIntro Travel for Final Cut Pro X.
Pixel Film Studios, leading developer of visual effect tools for the post-production and broadcast markets, announces the availability of ProIntro Travel enabling film editors to incorporate travel-themed introductory titles in Final Cut Pro X projects. "ProIntro Travel launches a new series of travel-themed Final Cut Pro X visual effects designed with the world traveler in mind!" ProIntro Travel is a collection of 30 self-animating titles created exclusively for use in Final Cut Pro X. Each title is professionally designed with customizable text, backgrounds, and elements. Type in custom text, change any element’s colors and even choose new animations using drop-down menus. Create a travel inspired project with ProIntro Travel from Pixel Film Studios. ProIntro Travel includes 30 introductory titles created exclusively for Final Cut Pro X. This way users have plenty of variety when displaying titles. Each ProIntro Travel preset is adaptable to any project and features customizable animations, colors, and more. ProIntro Travel is perfect for opening or closing a video. Just replace the text with the title of a video and set a desired animation. Set the background to be completely opaque, or have the underlying media show through the background. ProIntro Travel includes on-screen controls so that users can reposition, resize and rotate titles with absolute ease. Just move the puck reposition, the dial to rotate and adjust the ring to resize. Customize any element's color by simply using the picker to select your preferred color. ProIntro Travel lets users customize presets to perfection.